Dutch Hiber and Norwegian KSAT have announced a new, long-term partnership to create a state-of-the-art and reliable ground station infrastructure for Hiber’s Low Power Global Area Network (LPGAN), named Hiberband. 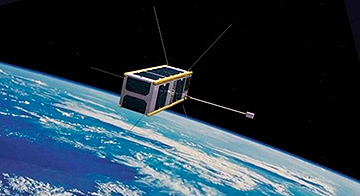 Artistic rendition of a Hiber smallsat. The first two satellites of the Hiberband constellation (Hiber One and Hiber Two) will be launched in the last quarter of this year. 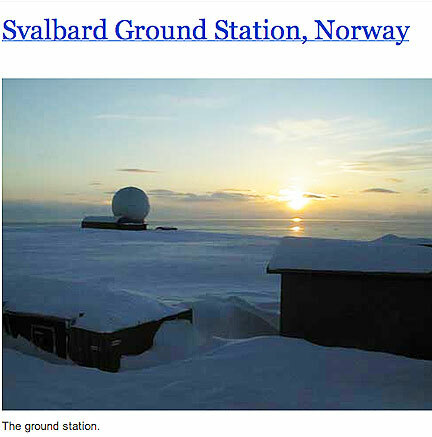 The new ground station network starts with a redundant network with two stations; one on top of Hiber’s Research and Development Centre in Delft, the Netherlands, and one on Svalbard in Norway. The ground stations use motorized 4.5 meter Cobham S-band antennas that will receive the data messages from Hiber’s satellites. Both stations also have UHF-VHF antennas for the constellation Telemetry, Tracking and Command (TT&C) and are connected to the Hiber Mission Control Centre in Delft. Both antenna systems are extremely robust and built to last for the coming decade. KSAT’s Svalbard Ground Station is uniquely located at 78 degrees North, close to the North Pole, which optimizes contact time for communication with the Hiber satellites that fly in a polar orbit. KSAT has introduced KSATLite, a global integrated ground network optimized for smallsats and smallsat constellations. Building on the foundation of expertise that KSAT has acquired through 50 years of ground station service operations, KSATLite is able to leverage many of the key strengths of the existing infrastructure. Maarten Engelen, Co-Founder and CTO of Hiber, said that creating a global network of super-efficient, super-affordable satellites and modems, KSAT was selected as the ideal partner for this innovative project. As a global Internet of Things connectivity provider, it is extremely important for Hiber to guarantee a high quality of service to customers worldwide. The company designed the ground station infrastructure with built-in redundancy to provide a highly reliable service and this partnership with KSAT provides that capability. Engelen continued that the Hiber satellites will pass the firm's Svalbard station as many as 14 times a day, providing additional download capacity, something that will be essential when the full satellite constellation is in place. Space segment and ground segment are both crucial for an optimal Hiber network and there is no more experienced ground station partner in the world than KSAT, especially when it comes to managing a constellation of cubesats in polar orbits. Depending on demand, Hiber will launch even more smallsats in the years to come, growing the constellation, and that is exactly why the scalability that KSAT offers is so important for the firm. This kind of flexibility is unique, making it easy for company expansion. With the completion of the ground station, Hiber is 'set to go' after the launch of the Hiber One and Hiber Two satellites during the last quarter of this year. Laurens Groenendijk, Co-Founder and CMO of Hiber, stated that the company has a start-up mentality and has found the same to be the case with KSAT. They are perfectly set up for supporting a smallsat-company such as ourselves, offering the needed flexibility both in solutions and in mindset — a very good combination. Rolf Skatteboe, President and CEO of KSAT, added that the KSATLite network consists of dedicated, high quality smaller antennas currently taking more than 10,000 smallsat passes per month. It’s brilliant in it’s simplicity; a high degree of automated operations and standardization, meaning that if a satellite is compatible with one antenna on the network, it is compatible with the entire network. In this case, it means that the total capacity of the Hiber system can relatively easily be extended. The Hiber ground station infrastructure is designed to provide a high quality service and is also highly scalable to deal with the increasing traffic volume of millions of IoT terminals world-wide. Extending the number of satellites and ground stations will grow the total traffic capacity of the Hiber system, and, in the future, will also allow for higher service levels. Beginning with a once per day service with the Hiber One satellite, the service level will go up to 100 messages a day, once the network has expanded the number of satellites and ground stations in the coming years.